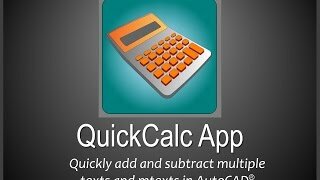 QuickCalc allows the user to quickly add and subtract multiple texts and mtexts within Autodesk® AutoCAD®. This is how it works: the user selects the operation to be performed (addition or subtraction), then performs the selection for the texts/mtexts to be included in the operation. QuickCalc will create a table showing the numbers used in the operation and the operation result. The app will detect if there is more than one number in the selected texts. For instance, if the user selects a text containing the following: "Area No. 20 (5.23 ha)", the program will ask the user if the number to be used in the operation is 20 (index 1) or 5.23 (index 2). After indicating the index and drawing scale, the user must click the Operate and Create Table button. The program will insert a table similar to the one shown in the screenshot.